What Is the Greatest Issue in Sports Today? 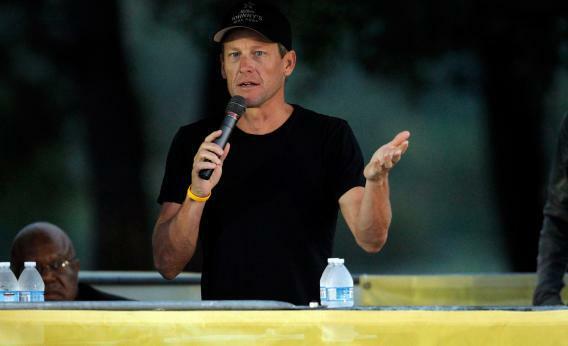 Lance Armstrong addresses participants at a charity ride supporting cancer survivors. Amstrong lost his seven Tour de France titles after choosing not to fight doping allegations. It would be easy to talk about the death of track and cycling as (even limited) American spectator sports, but those aren’t easy for Americans to relate to. It is worth noting, however, that for many years, the most important record in track and field was owned by a man who used steroids to achieve it. He may have lost the medal, but it doesn’t change the fact that Ben Johnson was the answer to the only question in track that matters, Who is the fastest man on Earth? Until Asafa Powell beat his time 18 years later. The main difference between the infamous Ben Johnson and the rock star Lance Armstrong, the former seven-time winner of the Tour de France (those are now voided, and he’s been asked to pay back the prize money), is that only one of them made it his business to be the best in the world at something else: evading detection. In sports where all that matters is pushing the body to achieve an extra few tenths of a second, the moral hazard of whether to use performance enhancing drugs has become too great and gutted the sports of any real integrity. And those sports don’t even make real money. It would be a mistake to think that because the big four American sports round up and suspend only a handful of players per year for violating their respective rules around performance enhancing drugs it’s not a problem. They’re not finding more usage because they’re not looking harder, not because it’s not there. The NBA in particular has been called out publicly again and again for being particularly lax. They do such a poor job of testing that a bigger mystery is why any players are discovered. They don’t test for the exotics and don’t do random testing during the season. Exactly how stupid would a player have to be to get caught? Stupid enough that only a few of the more than 700 players who have been in and out of the league over the last two years were caught. But as bad a job as the NBA, NFL, NHL, and MLB are doing with clearly articulating and enforcing their policies for PEDs, that’s not even the real threat. PEDs today are a rather cut-and-dried issue: There’s a list with names of substances on it, there are best practices around testing for them, and fines in place for enforcement. The fact that none of the leagues are hitting that relatively modest bar is an issue, but not one that will threaten their viability. But what about real performance augmentation? Like the half-dozen NBA players who flew to Germany to get a special knee procedure done that’s said to significantly reduce discomfort in the joint for some time, only to regress later? Why can’t this be done in America? What happens when there’s a player in one of the big four leagues with a prosthetic such as Oscar Pistorius? What about blood transfusions and joint and muscle augmentation through surgery? It’s no secret that players now are bigger, stronger, and faster than they have been in ages past. An offensive lineman on the 1972 Dolphins perfect season championship team is basically the same size as the average quarterback in today’s NFL, whereas the average lineman today is a superhuman specimen that’s bigger, stronger, and faster than anything in the league back then. But still, those are incremental differences, child’s play. We’ve been optimizing and tweaking without really overhauling. We’re now on the precipice of realistic, recurring medical augmentation that will make today’s athletes look weak, slow, and boring. In 10 years, we could look back at the LeBron era and wonder how someone so slow and fat ever scored so many points. How are leagues that do such a poor job of the rather trivial task of defining policy and enforcement for juicing going to define policy and enforcement for elective prosthetic procedures? And, to be clear, the danger isn’t that fans will tune out because the leagues aren’t enforcing enough, but that fans will tune out because they are enforcing too well. The steroid era in baseball rescued it after the strike in 1994. Without steroids, baseball might never have recovered. The leagues are very aware of this. Fans have spoken: They prefer their athletes juiced. They just prefer not to know about it. We love Lance; we’re not sad that he juiced, we’re just sad that we found out about it. It’s tempting to think that the moral hazard that gutted cycling and has made a joke of track couldn’t possibly affect our big four. That there’s no moral hazard in sports leagues bringing in over $20 billion annually. Ha. What is the greatest comeback in sports history? What are some examples of professional head coaches who were undeservedly fired?